Home redesigning, also known as “one-day decorating”, is a simple and affordable solution. In hours, Home Renaissance can perform a metamorphosis that will add greatly to the comfort and functionality of your surroundings. Better yet, we do it with your current furnishings. And your input. Of course, we may suggest procuring a few simple accessories to adorn your home. But in the end, home redesigning, when done with our thoughtful guidance, is working with what you already have. And cherish. We begin the process with a consultation. It includes a visit to your home to discover your preferences, as well as how you like to live. We take what we learn and make recommendations that reflect your needs and tastes, not ours. After all, this is about you and what makes you most comfortable. Next, we remove all the furnishings from your room. This permits us to take in the architectural focal points. If necessary and with your permission, we will “shop” the rest of your home for those unique objects you already possess that will complement the look of your “new” room. All of it done for the sole purpose of creating a refreshed and advantageous presentation of your space. Staging, the act of preparing a residence for sale, is becoming very popular. Especially as the real estate market becomes more competitive. Are you aware that a buyer’s first impression occurs within seconds of entering a home? This is why it is critical to create a favorable first impression for potential buyers. On occasion real estate agents will offer to help with staging. However, more often than not, your realtor’s recommendations are limited to cleaning and de-cluttering. Although these are important aspects of selling your house, staging goes beyond this. A professional stager will highlight your house’s best features: furniture placement, traffic flow, and architectural features. After all, most homebuyers cannot visualize the potential of a house. They need to be able to see themselves living in your home. Our goal is to help you sell your home faster and realize the greatest return on your investment. We look at your home as a buyer would. With a discerning eye. When we see things that concern us, we bring them to your attention in a written report. Then with a go-ahead from you, we assist you with the completion of some or all of the recommended improvements outlined and presented in our evaluation. Our suggestions can include de-cluttering, organizing, room redesign and decorating. With the appropriate steps taken, we can help speed up what can be the long and stressful process of selling your home. If choosing the right colors, fabrics and accessories is more a chore than a joy for you, consider our decorating consultation service. We also can do room planning to help you visualize how furnishings will fit into your room. With our eye for detail, sense of style and love of decorating, we will put together a plan that you will want to live with. Selecting the decorating accents to best complement a new décor is one of our greatest pleasures. 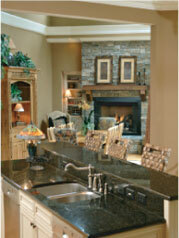 Allow us to assist you in hand picking the right finishing touches for your home and save you time. Homes get cluttered. It is a simple fact of life. Taking back your personal space begins with choosing our home organizing service. It will go a long way in helping you to organize your space. And your life. It is common to feel unsettled even after you have been in your new home for a time. This is why we offer our move-in service. Like our home redesign service, where we use your existing furnishings, only rearranging them in a way to create an appealing home décor, our move-in service is designed to make you feel like you are finally home. Great gift ideas reside at Home Renaissance. Please consider giving a redesign consultation or home redesign to someone you care about. They make ideal and thoughtful housewarming, birthday, anniversary, wedding and holiday gifts.